Takeaway: Spinach, endive, and chard all have good levels of some well-researched health promoting compounds and are well worth the investment in time and effort to grow. Lynette Morgan provides us with the best indoor growing practices for these superfoods, and provides some harvesting tips for maximum health benefits. The desire to provide fresh, high-quality fruit and vegetables for a healthy diet is often a deciding factor when first venturing into hydroponic growing. Tasty, super fresh, and highly nutritious leafy greens just plucked from an indoor garden have to be one of the healthiest and most rewarding aspects of growing your own produce. With bioactive compounds and beneficial phytonutrients such as antioxidants becoming more widely recognized as part of a healthy diet, growing your own superfoods to nourish and help prevent disease is an exciting prospect. Some of the vegetable and salad crops we consume are more of a nutritional powerhouse than others. While there is still much research being carried out into the potential health benefits of a range of plant bioactive compounds, some are already well-known. Spinach has long been considered a highly nutritious vegetable; however, there are factors that significantly alter the levels of vitamins, minerals, and bioactive compounds that occur in the foliage. The major micronutrients in spinach are vitamins A (from beta-carotene), C (ascorbic acid), K, folate, and minerals calcium, iron, and potassium, while the beneficial phytochemicals are carotenoids, flavonoids, beta-carotene, lutein, zeaxanthin, and phenolic compounds. Both phenolics and carotenoids have high levels of antioxidant activity. Lutein and zeaxanthin are important for eye health and are the only carotenoids found in the retina, where they have a protective effect from damaging light. To produce and maintain the highest compositional quality in spinach under hydroponic production, it is important to grow the crop quickly, under optimum light levels, harvest young, and eat immediately whenever possible. Studies have shown that spinach starts to lose vitamin C concentration almost immediately after harvest and considerable losses in ascorbic acid can occur during storage. Therefore, harvesting spinach just before preparation for eating is one way to maximize vitamin C intake. Growing spinach plants rapidly under good light levels to achieve maximum rates of growth and highest vitamin C levels also minimizes nitrate accumulation in the foliage. 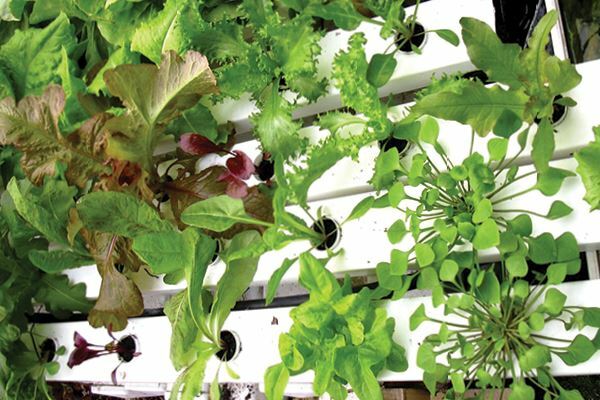 With high levels of nitrates in green leafy vegetables considered to be a health risk, hydroponic methods are one way of ensuring this is not an issue. Spinach and other leafy greens grown slowly under low light tend to accumulate more foliar nitrate levels, which should be avoided if nitrate intake in the diet is a concern. With hydroponics, exposing spinach, chard, and other leafy greens to a low nitrate nutrient solution (or just water) for a few days before harvest will significantly lower the nitrate content in the harvested foliage. Harvesting spinach at a relatively young stage also has benefits for compositional quality. The concentrations of ascorbic acid and flavonoids often decrease during plant growth, thus harvesting leaves before final maturity can give increased concentrations of bioactive compounds. Endive has two main forms that are grown hydroponically—a frilly or frisee curly endive type with finely divided leaves and a broader-leaved type called escarole. The mature leaves of this open-headed endive type are slightly bitter with the inner leaves being lighter in color and with a milder flavor. Endive is often incorporated into salad mixes, particularly baby leaf or mesclun, because of its unique leaf shape, colors, and slightly bitter characteristic, which adds depth of flavor. Endive contains a range of nutritional compounds, including vitamin A and beta-carotene, folic acid, pantothenic acid (vitamin B5), pyridoxine (vitamin B6), thiamin (vitamin B1), and niacin (B3), as well as potassium, manganese, copper, and iron. Endive also contains high levels of the flavonoid compound kaempferol, which some studies have been found to have a positive association with a reduced risk of developing several disorders and cardiovascular disease. Endives have a very open growth habit and require approximately the same space as bib lettuce; however, they are typically much slower growing than lettuce and more prone to physiological conditions such as tip burn and bolting under warm conditions. Under hydroponic production, endive, particularly the frilly or frisee types, are typically grown as microgreens or baby leaf. This way, their flavor remains milder than a more mature crop, and this largely avoids issues with tip burn and bolting. For baby leaf production, only a small space is required and the plants may be grown as cut-and-regrow crops or incorporated with a range of other salad green species seed mixes. Considered more of a cool season crop with a slower growth rate than lettuce, Swiss chard is available in a range of colors, including yellow, white, pink, red, and green, and has a mild spinach flavor. Like endive, chard contains the beneficial cardio-protective flavonoid kaempferol and is a unique source of phytonutrients called betalains. The red-purple and yellow stems and veins in the leaves of some varieties of chard have been found to contain a large number of different betalain compounds, which have been shown to have antioxidant, anti-inflammatory, and detoxification properties. Swiss chard also contains high levels of vitamins A, K, C, E, and magnesium, manganese, iron, and potassium. Cooler temperatures and higher nutrient solution EC levels promote the development of the red color associated with many of the health-giving compounds in this crop. 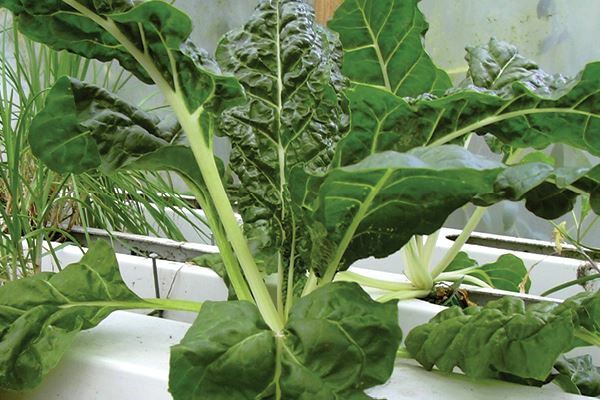 Chard can be grown through to maturity and the complete plant harvested by cutting at the base; however, in hydroponics, it is more commonly grown as a longer-term plant and the outer leaves removed as required. Chard is also a common ingredient in microgreen mixes or baby leaf salad cropping where its unique color combinations add variety. Bright Lights, Ruby Red, Bright Yellow, Fordhook Giant (green), and Magenta Sunset are chard cultivars often grown hydroponically, particularly for baby leaf production. Spinach, endive, and chard are all well-suited to hydroponic production and take up minimal space in an indoor garden if grown to be harvested relatively young. Endive and chard are straightforward to grow and can be produced in much the same way as lettuce in nutrient film technique (NFT) systems, float systems, and media beds. Ideal EC and pH levels of these crops is 1.5 mS cm-1 and 5.8 – 6.0, respectively. However, an EC of 1.2 is recommended under warmer growing conditions to assist with tip burn prevention. Spinach can be a challenging crop to grow hydroponically as it is prone to germination difficulties under certain environmental conditions. Growing spinach for baby leaf or microgreen production is somewhat easier than producing larger plants as mature spinach plants can be prone to developing pythium root rot, particularly in recirculating solution culture systems such as NFT. Media beds or substrate-based production systems are often more suitable for spinach, particularly if grown at a high density which can increase the risk of pythium outbreaks. There is a wide range of spinach cultivars suitable for hydroponic production and for different growing conditions and uses. Leaf type in spinach can range from smooth to savoyed (crinkled) and arrowheaded (Asian leaf) with warmer and cooler season types available. Cultivars selected for indoor hydroponic production of mature plants should have downy mildew resistance (to as many races of this disease as possible), with F1 hybrids producing the most rapid growth rates. If grown under warmer conditions (over 75°F), selecting cultivars with bolting resistance is a good idea. Spinach seed has an optimum germination temperature of 64-68°F, and temperatures over 79°F can prevent germination through inducing secondary dormancy in spinach seed lots. Spinach seed viability declines rapidly with age, so seed that has been stored in open packets may not germinate or only germinate erratically with poor quality seedlings as a result. Seed is best purchased in small lots and sown immediately to avoid the need for long-term storage. 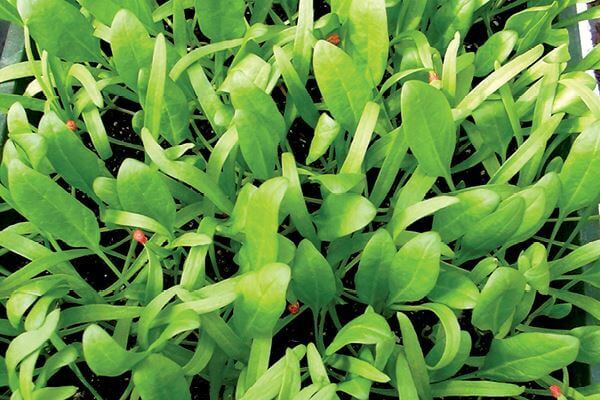 Sowing seed of spinach, endive, and chard directly into the position where they will grow in media beds or into small individual rockwool cubes or coco plugs avoids the requirement for additional handling, tends to prevent transplant shock, and helps prevent root damage. Hydroponic spinach nutrition is similar to that of fancy lettuce, though spinach has a higher requirement for iron and magnesium, as these elements are found at greater levels in spinach leaves than in most other salad green types. A general purpose vegetative nutrient formulation product can be amended with additional iron to levels of six to 10 parts per million (ppm) and magnesium to 65-75 ppm with use of supplements. EC levels for spinach are recommended to be run at 1.0-1.2 mS cm-1 for seedlings, 1.6-1.8 mS cm-1 under optimal growing conditions, and 1.4-1.5 mS cm-1 where temperatures are higher to assist with tip burn prevention. The ideal pH range is 5.8–6.0. Maintaining high levels of dissolved oxygen in the nutrient solution of NFT grown spinach and in other solution culture systems and use of solution chilling under warm growing conditions all help prevent pythium outbreaks and promote high-quality growth. Spinach may also be prone to leaf yellowing; this typically occurs under very cool growing conditions where the plant is unable to take up sufficient iron, where roots have become damaged during transplanting, or where oxygenation due to over watering or nutrient stagnation has occurred. Under good growing conditions, spinach can be a high-yielding crop, with yields of baby leaf spinach of 1.9-2.1 kilograms per square meter possible after 52 days growth. Spinach, endive, and chard are all best harvested in the early morning, when the foliage is most turgid and crisp. Foliage should be cut with a sharp knife to minimize tissue damage and oxidation of cut surfaces. Ideally, these should be eaten within a few hours of harvest; however, if storage is necessary, the correct conditions to prolong shelf life are rapid cooling down to 34°F and 95-98 per cent humidity (i.e inside a plastic bag). Functional foods with high levels of important phytonutrients play an important role in a healthy diet. Using hydroponics, we have a unique tool to not only provide these super fresh but to also influence the compositional quality of these to our benefit.